You lie on your back on a couch and are asked to keep still while an X-ray detector (the 'scanner') comes over the area to be tested. An X-ray machine fires X-rays towards the detector. The bones commonly scanned are the vertebrae (back bones), hip and wrist. (These are the bones that most commonly fracture due to osteoporosis.) The scan usually takes between 10 and 20 minutes, depending on which part of your body is being examined, and whether a central or peripheral scanner is being used. Peripheral scanners are available in some GP surgeries and can be used to check the bone mass density of the heel, wrist or finger. 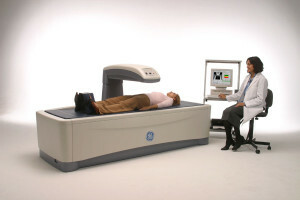 You do not need to do any special preparation prior to a DEXA scan. At the moment the DEXA scan is removed from the SVB package and is not being covered. Other personal insurance companies may still cover the DEXA scan. We advise to contact your insurance company about your medical coverage. You can get a referral (verwijsbrief) from any doctor (Huisarts) or Specialist. We offer the possibility of having a DEXA scan with a full report. The costs per scan are ANG 250 incl. Ob. If you have any questions or need more information please contact us here.